MTA New York City Transit was quick to recognize the popularity of that new electronic gaming sensation Pokémon Go. Officials also spared no time in identifying the potential hazards of trying to catch the creatures in surroundings where there is a four-and-a-half foot drop to the tracks. 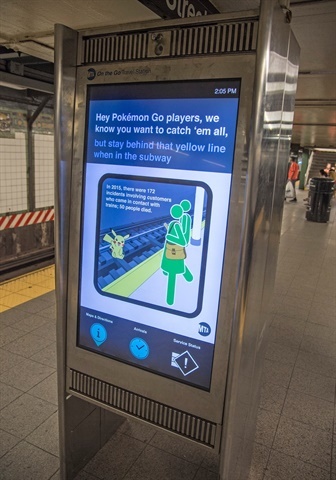 In response, the agency has created a new safety campaign for its “On The Go” (OTG) travel station kiosks, reminding customers to stay safe by remaining behind the yellow line when trying to catch the animated creatures. The digital screen campaign consists of a brief animation warning customers to stay safe as they play the game that seems to have taken the country, and the world, by storm. The messaging uses the iconic red and green “Bubble People” figures used in the popular “Courtesy Counts” campaign combined with language from the agency’s ongoing platform safety campaign. Of course, the red figure turns green once he does the safe thing by stepping behind the yellow line. 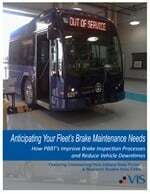 The On The Go campaign began running July 15. New York City Transit had previously issued similar warnings through Twitter and Facebook posts that generated more than 400,000 views in less than a week. They both urged customers to be mindful of their surroundings and keep well back from the edge of the platform. The MTA OTG network currently consists of 200 units at 39 subway stations in the Bronx, Brooklyn, Manhattan and Queens; by the end of the fourth quarter 2016, there will be 380 kiosks in 73 subway stations. Customers can view the real-time service status of subways, buses and railroads; get travel directions with Trip Planner; access elevator/escalator status; and scan MTA, neighborhood and station maps. NYC Transit also uses the OTG to push service alert and emergency messaging to the entire kiosk network, a select group of kiosks or an individual unit during a service event or emergency situation, posting granular service alternatives at affected locations.